Most awaited news from Sony Mobile has just came up about android 4.4 KitKat update on Xperia devices, it is now CONFIRMED that Android 4.4 KitKat for Xperia Z, ZL, Z Ultra, Z1, Tablet Z will come very soon thought it is not expected this year obviously due to scheduling of android 4.3 update in December. Sony Mobile as announced on their official blog that Xperia Z, ZL, Z Ultra, Z1, Tablet Z will be getting android 4.4 KitKat updates in future though no ETA has be given yet. Strange to see that Xperia ZR has not been named yet, may be they will do in future or they won’t it still remains a mystery. So in a short note we are confirming this as per mentioned by Sony Mobile statement. We’re also happy to tell you about the first raft of Xperia products that we’ll make Android 4.4 Kit Kat available for – they are: Xperia Z, Xperia ZL, Xperia Tablet Z, Xperia Z Ultra and Xperia Z1*. Which Xperia Devices will get Android 4.4 KitKat update and when ? 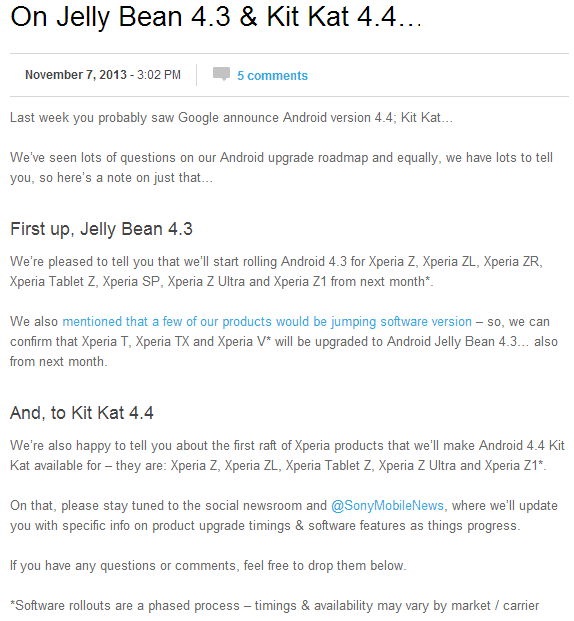 Android 4.4 KitKat for Xperia Z, ZL, Z Ultra, Z1, Tablet Z is confirmed. No ETA. What is Strange here ? Nothing mentioned for Xperia ZR, C, and SP. As Sony says that Xperia Z, ZL, Z Ultra, Z1, Tablet Z are the first batch of devices getting android 4.4 KitKat update so it means we may see Xperia ZR, Xperia SP, Xperia C soon joining the list. When should we expect it to come ? As in December Sony is rolling out android 4.3 update for Xperia Z, ZL, Z Ultra, Tablet Z, Z1, ZR and Xperia SP, T, TX and V so we may see android 4.4 KitKat update next year in January 2014. Other Devices which can get android 4.4 KitKat update ? 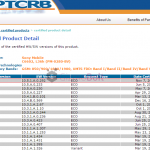 Other device which have very strong chances of getting android 4.4 KitKat update is Xperia T, TX and Xperia V.
No updates for Xperia S, SL, Acro S, Ion, P, J, L, Tipo, Miro confirmed. how do i feel ? errrm As a Xperia L user..i’m sad and disappointed. since 4.4 Kitkat is optimized for run on 512MB RAM what’s the point of ignoring L from the update? are you sure you confirmed that? 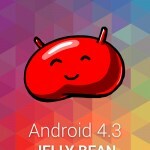 Don’t you read it carefully, we have added the OFFICIAL SONY MOBILE Tweet on this and Link – http://blogs.sonymobile.com/2013/11/07/on-jelly-bean-4-3-kit-kat-4-4/ Check yourself please. No updates for Xperia S?… WTF! How’s about Sony Xperia C C2305 update 4.3 JB and next android 4.4 KitKat ??? Date And Time Buy : 27/10/2013 10.30 AM. This xperia are new smartphone 2013 from Sony 2013..
No 4.3 for Xperia C well it will get directly 4.4 next year after the Z family get it. If Sony is supposed to stop the support for 2011-12 Smartphones, it simply means they are insulting the feelings of their old customers who have bought these Damn Phones. I have read in so many forums that this is all the marketing strategy to bring out the money from the pockets of the customers. To do this simply stop the support for the old phones and launch new phones with advanced hardware and facilities along with the lame excuses that the old phone’s hardware won’t support the new updates. But they forget one thing that on one end they might be making money by manufacturing and launching the high end phones but on the other hand (the hidden part) they are losing their old customers. When the customer has his mindset that just after 1-2 years Sony will stop the support for their phones (being assured on the basis of past history), they will never buy Sony at all. 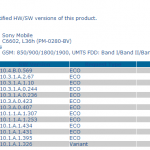 phone xperia t,tx,v android 4.4? ?